John Burke, a former Reuters correspondent in Paris, reports. Put your car or freight on the 18,425-ton Côte d’Albâtre or Seven Sisters this year, as it could be your last chance to go between Newhaven and Dieppe. Seine-Maritime council may stop subsidising the annual loss of €20m, especially if the Marpol (International Convention for the Prevention of Pollution from Ships) directive towards cleaner fuel raises costs. DFDS, which operates the service as Transmanche Ferries, says filters would comply with Maripol, and the cost of €8m would be repaid within three years. Wider negotiations, involving the Tug Horizon committee of private and public partners, have not yet produced an overall solution that would involve an extra boat, improved logistics and better publicity. 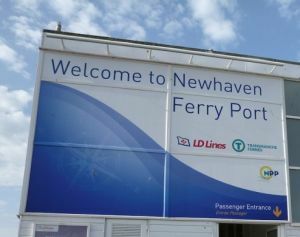 Newhaven’s town clerk, Jacqueline Cole, complains, “Many people do not know about the ferry” – a view shared by Eveline Duhamel at Dieppe’s chamber of commerce. Regular sailings across the 75 miles of English Channel were suspended only during three wars, but amazingly the recent 250th and 150th anniversaries for sail and steam were not given any publicity. France’s touristic promotion is also feeble both in Normandy and London, largely due to lack of co-ordination. Last year, Transmanche carried 238,000 passengers, but those on foot markedly declined when SNCF closed its harbour station and withdrew direct services from Dieppe to Paris. This means taking a connecting bus to the town station, and getting a train to Rouen, from where there is a connection to Paris (St Lazare). Nevertheless, it is possible to be on the morning boat from Newhaven and reach Brittany’s capital, Rennes, within 12 hours. British rail journeys take 1½ hours between London and Newhaven that is also well connected with nearby Brighton and other South Coast resorts. East Sussex council is so keen for the ro-ro passenger ferry to continue that £23m has been allocated to new access from the A.259 highway by 2017. Built in Spain 10 years ago, the Côte d’Albâtre and her sister-ship can each carry either 127 cars and 51 trailers or 227 and 31. Some of the 600 passengers, including lorry-drivers, are accommodated in 50 en-suite cabins during the four-hour crossing, and there are reclining seats in two lounges. Each boat also has a bar, shop and self-service restaurant as well as facilities for children. Taking a car with two adults costs £78 each way.